Portrait of a young Venetian woman, n.d.
Oil on canvas, 50 x 63 cm. 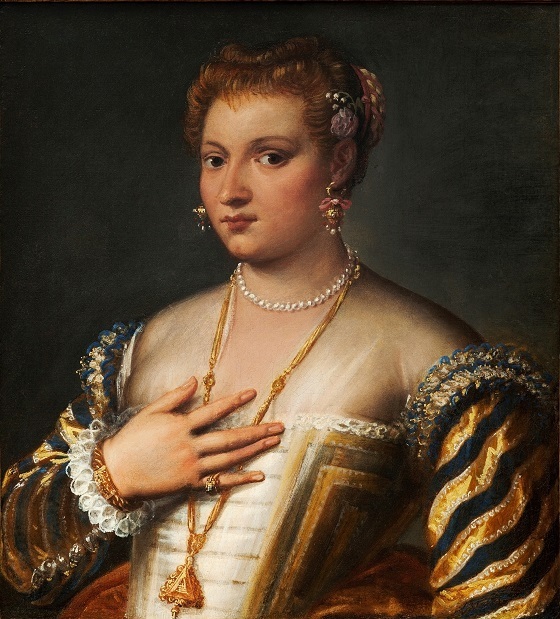 This portrait of a well-dressed Venetian woman is characterised by the artist’s distinct flair for depicting different objects with great care, as evidenced by the staggering wealth of detail. She looks sideways at the viewer with a hand on her chest. She is wearing a cap with a red band behind her curly black hair and a pearl necklace as well as a gold chain with a triangle-shaped piece of jewellery. Due to its delicate colour scheme, the portrait has previously been attributed to Titian, and the young woman was thought to be the Venetian master’s daughter Lavinia, whom he often painted. However, many art historians would later argue that the true artist behind this portrait is Franscesco Montemezzano, a man who both copied and assisted Paolo Veronese, who was one of the main figures in the Venetian school.